Hey y’all! Hope everyone is doing well and staying warm! It’s unseasonably chilly here in LA, and with temps in the high 40’s and windy conditions, it’s safe to say that the Coldpocalypse is among us. Even with the weather this scary, campus is still a beautiful place to hangout/study/eat/procrastinate/you name it. If you’ve been on a campus tour you know the joke about USC standing for the University of Summer Construction, but the constant maintenance going on is so worth it to have some of the nicest and most cutting-edge facilities all in one central location. While there are so many cool buildings and places on campus, my personal favorite has to be Ronald Tutor Campus Center because of its versatility. RTCC, or Campus Center, is literally in the center of campus, and is a hub for students and visitors alike. There are several dining options from Panda Express and The Habit to Lemonade, and my favorite, Seeds Marketplace (get the #2 with bacon). With plenty of indoor and outdoor seating, Campus Center is a favorite for prospective students grabbing a bite before or after their tour, and for students who want to socialize and be around fellow Trojans. 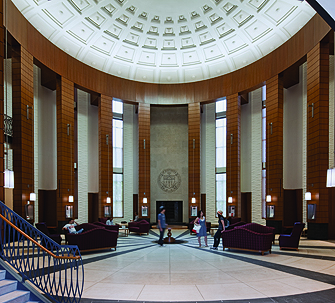 The Student Union, Admissions Office, Undergraduate Student Government, and Student Resource Centers are almost all located in Campus Center as well. As a member of the Interfraternity Council I am often stationed in the Fraternity & Sorority Leadership Development Office doing homework or chatting with fellow Greek leaders. During exam weeks I also utilize the many study rooms that are scattered throughout the buildings. They are definitely a hidden gem that the large majority of students don’t really know about, so even at the busiest of times you can always find a good spot to buckle down and study. One of the coolest things about Campus Center is that you never know what will happen when you’re hanging out in the courtyard. A few things I’ve seen break out in Campus Center during my time at USC have been spontaneous A Capella competitions, a surprise Trojan Marching Band performance, and even a choreographed Super Hero battle on Halloween. You’ll definitely never be bored at Campus Center. FINAL: USC 98, UW 88. In other news, the Trojan basketball team rebounded (pun intended) from a tough two-loss road trip to beat Washington and Washington State this past week. Things are looking up for the Trojans as we’ve been projected as a #6 seed for the March Madness bracket, and the home games are the most fun they have ever been.